The California nebula, NGC 1499, is a hydrogen emission nebula in the constellation Perseus. The Nebula glows from hydrogen atoms emitting in the blue (hydrogen beta + hydrogen gamma), and red (hydrogen alpha) to give a magenta-pink color in a natural color image. The region also shows abundant interstellar dust, seen as the burnt-orange color. The California nebula is about 1000 light years away and is very difficult to observe visually due to its low surface brightness. But even a stock digital camera can record its beauty. Technical. Canon 7D Mark I 18-megapixel digital camera and Canon EF 70-200mm f/2.8L IS II USM Lens. at f/2.8. Thirty nine 60-second exposures at ISO 1600 were added (39 minutes total exposure). 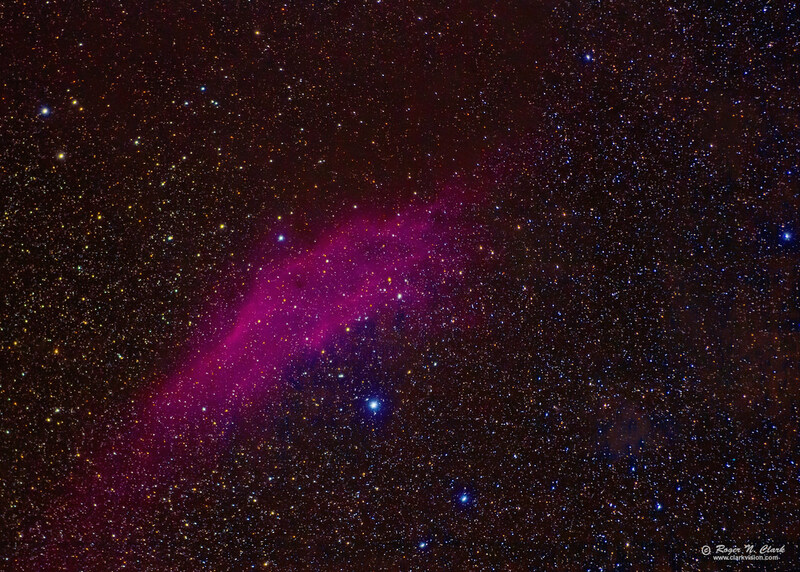 The California nebula is a very faint nebula, so this image demonstrates that the standard 7D Mark I is an excellent low light camera for it to record so much detail in this exposure. Full size image is at 4.4 arc-seconds per pixel, and this view is about 1/3 of full scale. No dark frame subtraction, no flat fields. Tracking with an astrotrac and no guiding. This image reaches to very faint levels. The donut shaped burnt orange spot of interstellar dust in the lower right (about half way from the California nebula to the corner) has a surface brightness (green passband) of about magnitude 23 per square arc-second, significantly fainter than the skyglow at 21.9 magnitudes per square arc-second. The nebula was nearly overhead while this image was acquired. CEFA = 30600 minutes-cm2-arc-seconds2 (4.4 arc-seconds / pixel). Modern DSLRs like the 7D Mark I include on sensor dark current suppression and low fixed pattern noise at ISOs around 1600 and higher, making no need for dark frame subtraction. Modern raw converters correct for light fall-off and also correct for hot/dead/stuck pixels. This makes processing low light images easy: simply align and average. See my series on Astrophotography Image Processing for more details. See my review of the Canon 7D Mark I and why it is so good for astrophotography: Canon 7D Mark I sensor analysis.